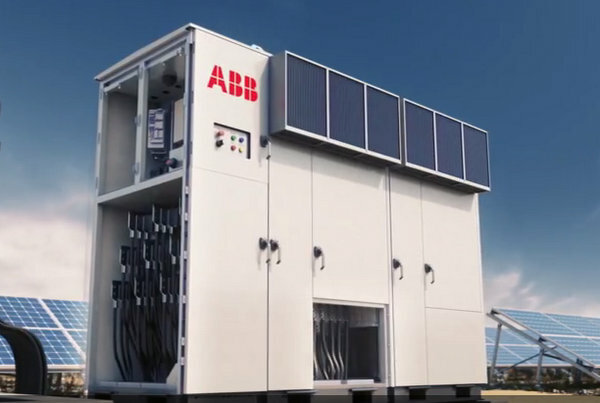 ABB says its PVS980 central inverter increases the amount of incoming solar power connected to a single inverter by as much as 40 percent, which can be a big win for the economics of a solar installation. Thanks to its increased power, the PVS980 central inverter also allows operators to use 30 percent fewer inverters than previously. The high power 1500 VDC central inverter PVS980 is capable of processing more incoming direct current power from photovoltaic (PV) panels through one inverter, reducing the total number of inverters needed onsite, which helps reduce overall costs across the lifetime of a solar plant. Central inverters are used for applications such as large field installations as well as large arrays installed on buildings and industrial facilities. Originally introduced at Intersolar as a concept last year, the PVS980 is now shipping commercially and has already seen strong interest among customers, with a number of pilot projects in place. Another attribute of the new inverter is that it is designed to seamlessly integrate into digital smart grids and operate efficiently in reducing the carbon footprint of electricity consumption. ABB engineers have improved the compactness of the device, enabling a power density increase of more than 40 percent making it possible to build large power rated inverters in the same physical size. Avoiding external air entering the critical compartments of the inverter, the inverter can operate from below freezing to extreme heat in 100 percent humidity without jeopardizing functionality. The very wide temperature operating range, designed to withstand the toughest environments, is working without derating to up to 50°C with a water- and dustproof outdoor enclosure. Using ABB’s innovative self-contained cooling system, the central inverter does not require refilling of liquids, and has no pumps or valves that need to be serviced. With optional remote condition monitoring, plant operators are able to gain operational data and more accurately plan maintenance.